Well, as life would have it, things need to be re-done because a good idea went south. I posted a couple of weeks back about several things I had done in Freedom to make life a bit easier, and one of those was a couple of LED lights attached to the ceiling to make it easier to find our way inside after dark. The whole precept was open the door, step up, push the light tab and voila’ LET THERE BE LIGHT. It worked very well until the heat from our current day time temperatures (and it’s March, so even though it’s warmer than usual, it is not that hot) made the inside of the van warm enough to render the glue on the sticky tape unfit to hold the lights up. I found them on the floor. Experienced van dwellers know what they are talking about; tape is usually not a good choice for adhering items to any surface inside a vehicle. It just gets too hot inside. Sooooooo…….. these terrific little lights will be reinstalled using screws. Fortunately there are holes already drilled on the back plates so it was an easy fix. And interesting that the company knew about the tape situation! Perhaps that’s why they caution against using the tape. BWAAAAAA. I won’t bore you with another picture of said lights, but if you would like to be reminded of which ones I am talking about you can see the former post HERE. 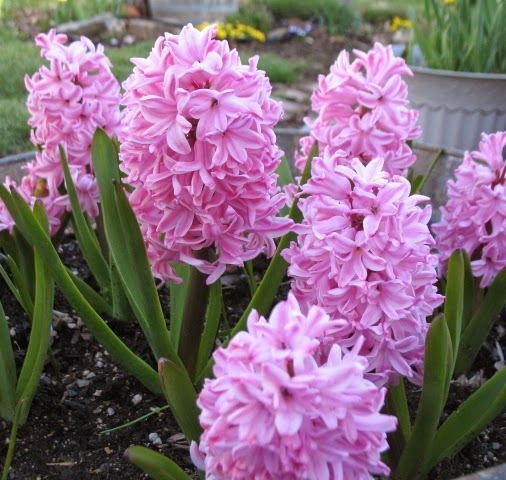 Can’t have a post without a pic, so here’s a shot of the hyacinths that are in glorious bloom. Ahhhhh, spring. There’s nothing like it! Thank you for stopping by Two Dogs today. Enjoy your Sunday and have a wonderful week.